Our stay was very comfortable and it was a convenient area to be in. Publix was right up the street and we were not far from where we had to go. Our stay was great. It was like a home away from home. And we thank you so much for having a Christmas tree there. The kids were excited to have that to wake up to on Christmas morning. The paradise properties team was great however the staff in the community office didn't seem to thrilled to have to help anybody. When I checked in to my parking pass, the receptionist was gone so a lady from one of the offices had to help me. She came out, stared at me and preceded to talk to one of the other people in the office. Other than the office staff the security people were always friendly and had a smile on their face. The property was great. Only complaint was the coffee pot. We really enjoyed being able to feel like we were coming home rather than back to a hotel room. It was a pleasure working with Angela. She was very responsive from booking through departure. We were impressed at her speed of answer when we inquired about the property months ago and how prompt her service was when things needed repair or we had questions. Great job! We enjoyed the property and our stay at the house. The master bedroom was beautiful and the entire house was very spacious. Had the pool not been so cold we would have used it but enjoyed grilling out on the lanai a few evenings. I mainly dealt with Angela and found the entire process easy and very much worth the money. We may never stay in a hotel room again. It was in a good subdivision and we even said hello to the people next door. We actually felt at home very quickly. Angie is great to deal with. I will use you guys again, but will not stay in that house again. I didn't like the home owner being in the house when we arrived. Management Note: While we book this home for the owner, she manages it herself, and likes to greet guests when they arrive. Many people like this level of personal service, however, not everyone is comfortable with it. I've always been served very politely and efficiently, being served in everything we needed. The property is excellent, from the security applied for entry clearance in the condo, to the tranquility and all the facilities found in the condominium as much as the house. 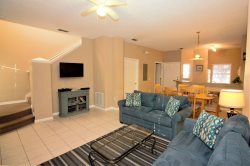 Great place to stay, with markets, shops and gas stations nearby, as well as the parks stay a few minutes. This was my fourth stay here at this property and it went smooth as usual with my booking. Great stay and the house performed as expected. Hopefully I will be back next year. I had a great weekend get away, the house was big and spacious it was everything i needed!!!! We do hope to return. Helpful and always willing to help in whatever it takes !!! We chose the Paradise with no indication of anyone, did research rents homes in Orlando and found they had several houses in the condominium we wanted ... loved the experience, we recommend to all !! We loved the house. It was roomy and beautiful. GPS got us to the stores which turned out to be very close.The kids loved the playground. The sidewalks, I loved them, weird I know, but walking around the neighborhood with the children on sidewalks was awesome. Rolling down the hills with the children, priceless. It's flat where we live, so yeah, those little things were great. My family can't wait to do it again. Thank you very much for our time together with the ones that mean most to us. The kids are planning the next trip, they want the same house FOREVER AND EVER for all our vacations. I felt it was more than a business for the P.P. team. They are very friendly and were extremely accommodating of our unique situation and needs, coming from outside the U.S. They went out of their way to make our visit a truly pleasant experience. We appreciated all they did for us. We thoroughly enjoyed ourselves and hope to visit again. With so much nearby we have lots yet to see, taste, and discover when we're not lounging at the pool. Thanks for a relaxing and memorable vacation. Wonderful family time. We all enjoy this awesome property. Kids had a blast... Thanks a lot!!!! I spent 40 years of my working life dealing with Professionals. I have participated on many professional development workshops and development tours. I know what and how a professional acts. The members of the Paradise Property team are without a doubt true professionals that know what the service industry is all about. The staff is very friendly and always did their best to help us have a great vacation. We spent a 13 days vacation with a family of 6 on this property and the house was very spacious, there were plenty of room for the kids and adults. It was very nice to come home after a busy day on the parks and be able to relax and have dinner together. The kids loved the pool area and wanted to go there everyday. Also, the fact that the staff received our packages for us and delivered them to our home was definitely a plus, since we could enjoy ourselves without any concerns. I would recommend this home and this company to my friends at any time. Everyone was great - I never had any problems getting answers, booking and paying the balance up was easy and I always received communication of receipt of payments. I thought the property was beautiful - it was as advertised in the pictures we had received. I loved the fact that it was a gated community. The resort staff was very helpful and ready to make your stay memorable. We thoroughly enjoyed our stay at your property. Thank you! Angie was informative and very pleasant. Loved the property, centrally located, and we felt safe. We generally had a good time with some minor glitches in the condo, but the overall experience was great.